This page covers the author of The Eye of the World. For other authors named Robert Jordan, see the disambiguation page. New York Times bestselling author Brandon Sanderson will read from and sign his first young adult book, The Rithmatist at Provo Library. “The Rithmatist, while it’s definitely as clear and exciting as a YA novel should be, is every bit as deep and richly invented as the best of Sanderson’s adult novels” says Orson Scott Card, award-winning science fiction author. Sanderson grew up in Lincoln, Nebraska. He teaches creative writing at Brigham Young University and lives in Utah with his wife and children. He is the author of several epic fantasy novels, including the Mistborn series, its followup The Alloy of Law, Warbreaker, and The Way of Kings. He was chosen to complete Robert Jordan’s bestselling Wheel of Time series. Robert Jordan’s multi-volume epic fantasy series, Wheel of Time “has come to dominate the world Tolkien began to reveal” (New York Times). Following his untimely death in 2007, Jordan’s wife and editor Harriet McDougal recruited bestselling fantasy novelist Brandon Sanderson to use Jordan’s extensive drafts and notes to complete the series with The Gathering Storm, Towers of Midnight, and A Memory of Light. A creative writing teacher at Brigham Young University, Sanderson is the author of more than a dozen books, including Elantris, the Mistborn series, the Alcatraz series, The Alloy of Law, and Warbreaker. A Memory of Light is the 14th and final volume in the grand Wheel of Time saga. Milford - BRANDON SANDERSON event revised 1-22-13. We are thrilled to announce that we will be part of BRANDON SANDERSON'S tour in support of the final book in the Wheel of Time series, A Memory Of Light. Please note: to ensure enough room for all, we have partnered with the Amato Center in Milford to host the event. Visit their website for information: www.amatocenter.org OR www.svbgc.org This event is free and open to all. No tickets required. Please read below. SIGNING PROTOCOL: FAQs answered. Brandon will sign 3 books per trip through the line. He will only sign books he has written. Due to the large number of people expected, Brandon will sign books for people who wish only a signature first (form line 1), followed by those wishing to have theirs signed & personalized (form line 2). Post-its will be provided for personalizations to be written legibly & exactly as you want it. Brandon reserves the right to refuse any request he doesn't feel comfortable with, including body parts. Photos with Brandon - yes - Be prepared to sit next to, or crouch down next to him, and remember time is of the essence. *From Brandon's website: "As I said, I've requested that the signings all be open to anyone. Please be respectful and realize one of the reasons that places like Amazon can give you the books so cheaply is that they don't have to maintain or pay rent on expensive storefronts in retail areas. Support your local booksellers; it's because of them that we can have signing events. If possible, I'd ask that you go and buy the book from the store where you're planning to see me. And even if you don't buy your copy of AMoL at the signing, it's nice to support the store hosting me by buying at least one book (by any author) while you're there." We agree! **PLEASE NOTE: A Memory Of Light is discounted at our stores 30% ($24.49) until the first of February. So hurry to purchase your book(s) in advance and SAVE! Feel free to contact us to reserve a book for you. Thank you for your support and cooperation in advance.We're looking forward to a smooth and trouble-free event! A Memory Of Light, the 14th and final volume in Robert Jordan’s The Wheel of Time®, brings to a close the legendary epic fantasy series. When Robert Jordan passed away, he had prepared for the moment with hundreds of pages of notes devoted to the concluding volumes and a request to his widow and long-time editor, Harriet McDougal, to find a successor to finish the series. That successor, a renowned epic fantasy author in his own right, Brandon Sanderson, joins Harriet to celebrate the concluding volume with The Wheel of Time® fans. This is a ticketed event – tickets for the signing line are available with purchase of A Memory Of Light from Mysterious Galaxy, available now. Robert Jordan , The Gathering Storm. 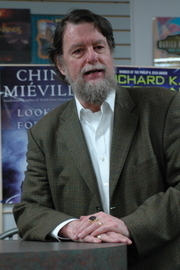 "Robert Jordan" is composed of at least 8 distinct authors, divided by their works. You can edit the division. Robert Jordan is composed of 5 names. You can examine and separate out names.